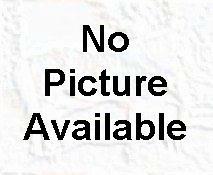 Star is a 1985 AQHA (2386655) mare. 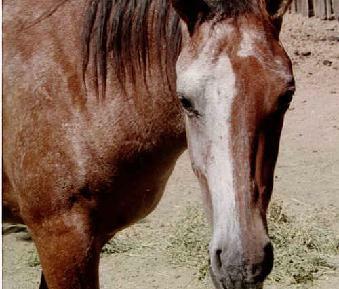 Star's base color is buckskin, however, she was registered with the AQHA as a red roan, probably because seasonally there are lighter (almost white) streaks in her coat. Also, she only shows her darker brindling seasonally, unlike Brenda (my other brindled mare) whose brindle pattern is visible year round. 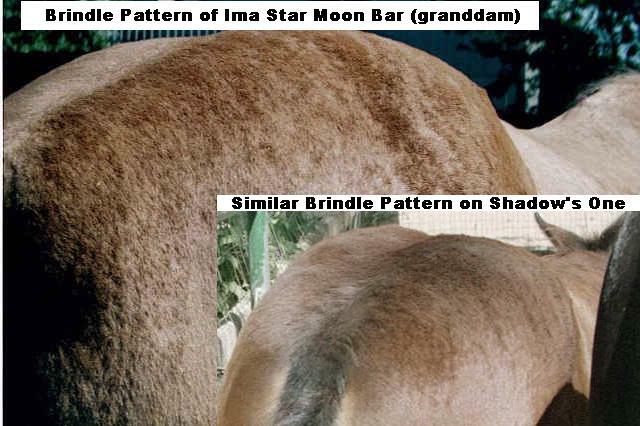 While this may be the effect of modifying genes on a single basic gene for brindle, I feel it is more likely that the brindle pattern Star carries may not be the same genetically as the brindle pattern Brenda carries. This would mean that there are possibly several genes producing a phenotypical (outwardly appearing) brindle pattern, similar to paints/pintos, in which there are several genes which produce white spotting. Star has produced five foals to date, 3 of which carry her seasonal pattern. This indicates there may be a gene involved, which is inherited dominately, since approximately 50% of her foals have inherited the pattern from her. In addition, one of her colts has also produced brindled foals, indicating the pattern is capable of being passed from generation to generation, also lending support to the idea of gene for brindle. Below is a summary of Star's offspring. 1995 Grullo AQHA (3363744) Seasonal Brindle daughter of Star by the AQHA grullo stallion Miracle Moon. Like Star, her brindle pattern is seasonal, so usually you cannot see any darker striping on her coat. However, she has coat texturing which is visible (on close observation) year round, although without the darker striping, it is easily missed. Candy has also developed more striping as she has gotten older, so seasonally when the darker striping does appear, it is more noticeable. 1997 mahogany bay AQHA stallion (3625847) out of Star by the seal brown roan AQHA stallion Malbec's Silvery Moon. He is a solid mahogany bay color with no white hairs on his body at all, only a small star on his forehead, indicating he did not inherit the roan gene from his sire. However, I thought he might be a carrier of Star's type of brindle pattern (seasonal brindle) because of his unusual curly texturing on his legs, and his sparser mane and tail (like his dam Star). However, he doesn't actually exhibit any striping himself (not even seasonally). I had to wait until he was old enough to do test breedings to confirm if he was a carrier of the seasonal brindle pattern or not. He has sired numerous foals to date, reproducing the seasonal brindle pattern on non-brindle mares, indicating that he is indeed a carrier of the seasonal brindle pattern. Below are a couple of his foals. For a complete history, see his separate article. 2A. His first foal that arrived in 2000, "Millie" (Brenda's Millennium), is out of the brindle mare (Brenda Batty Atty). She is registered in the Half Quarter Registry (12502 1/2). 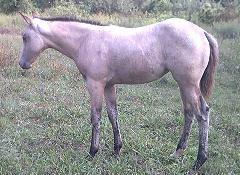 This is the best colored foal I have ever gotten out of Brenda. Millie also exhibits the curly texturing and sparser mane and tail, so she is perhaps a combination of the two types of brindled patterns. 2B. His second foal that arrived in 2001, (Shadow's One), is a bay with the seasonal brindle pattern out of a non-brindled black mare (Brenda's Shadow). She is registered in the Half Quarter Registry (12501 1/2). 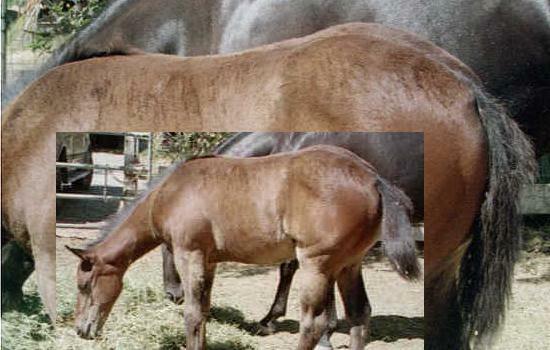 This foal has the same seasonal brindle pattern as Star (his dam), indicating he is a carrier of Star's type of brindle pattern and is capable of passing it on, even though he is not visibly striped himself. 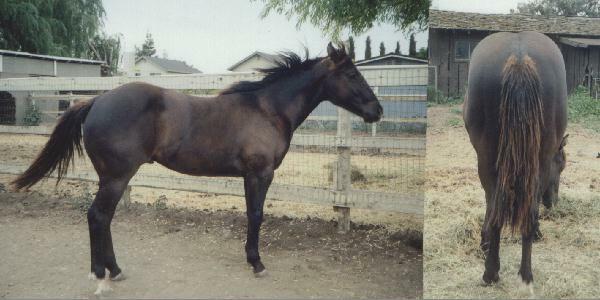 1999 smoky black AQHA colt (3789286) out of Star by the same seal brown roan AQHA stallion as Ima Star Brindle Bar above. While this horse is a full brother to the above stallion, he is non-brindle. His color is unusual, however, and a lot of people think he is a liver chestnut. His base color is actually black, and he appears to have gotten the Ccr (buckskin/palomino) dilution from Star, so he shows the brownish color some smoky blacks will appear. Usually the Ccr dilution has little effect on black pigment (the reason the points on a buckskin stay black). 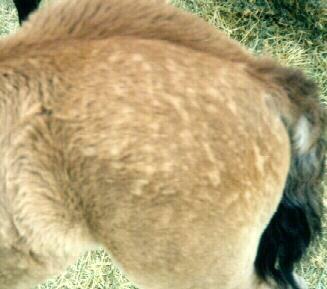 However, sometimes they will appear brownish, like this colt. 2005 buckskin APHA or AQHA filly (xxxxxxxx) out of Star by a stallion owned by Janelle Johnson. This filly is a seasonal-brindle like Star. Janelle says she is almost a carbon copy of her dam. 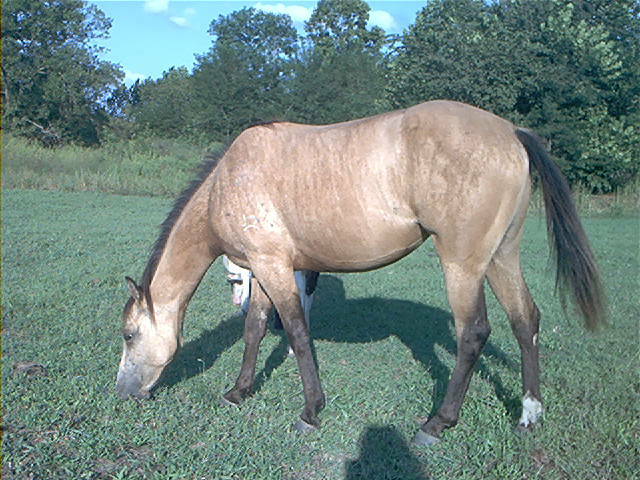 2006 very light buckskin AQHA filly (xxxxxxxx) out of Star by her son Ima Star Brindle Bar (linebreeding). Janelle says her stripes are such a light taffy color, it is hard to see the brindling on her in a photograph, but that she is definitely a seasonal-brindle like her dam.